Passatte tutte le verifiche, invio di segnalazione al CBAT - Daniel Green . Nome e cognome segnalatore reports the discovery by Nome e cognome scopritore, on behalf of Nome Programma (eventuale), with the 0.00 m telescope of the Nome Osservatorio (Nome località- Italy) of an apparent supernova in nome galassia, on unfiltered CCD images taken on data (mag about +00.0 - limiting magnitude about +00.0) and data UT (mag about +00.0 - limiting magnitude about +00.0). The new object is located at R.A. = 00h00m00s.00, Decl. = +/-00o 00′00″.0 (equinox 2000.0), which is 00 arcsec east/west and 00 arcsec north/south of the nucleus of the galaxy. CROSS image of the same field taken on aaaa mm. 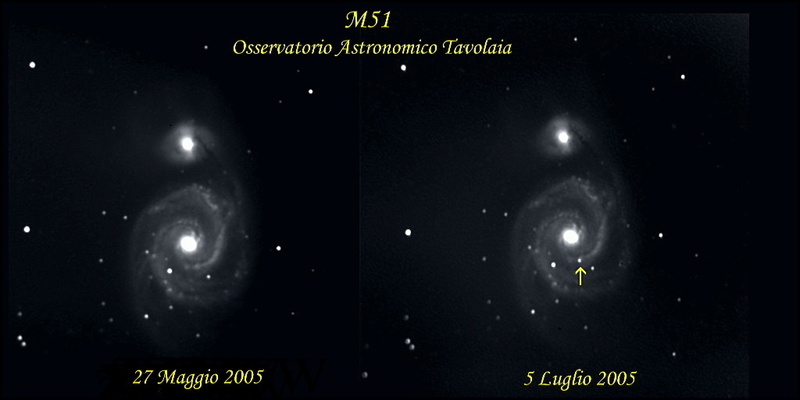 dd.0 showed nothing at the position of the apparent supernova (limiting mag about +00.0) and it does not appear on Palomar Sky Survey infrared, red and blue plates.